Last week, the United States and other regional contributors sent three humanitarian aid convoys to checkpoints in Colombia and Brazil bordering Venezuelan territory intended for Venezuelans and Venezuelan refugees fleeing the country. Aid workers remain unable to provide healthcare professionals in the country with emergency medical resources because Maduro – who is no longer legally president of the country but still controls the military – ordered soldiers to blockade the bridge that connects Venezuela to Colombia. “Who are we? 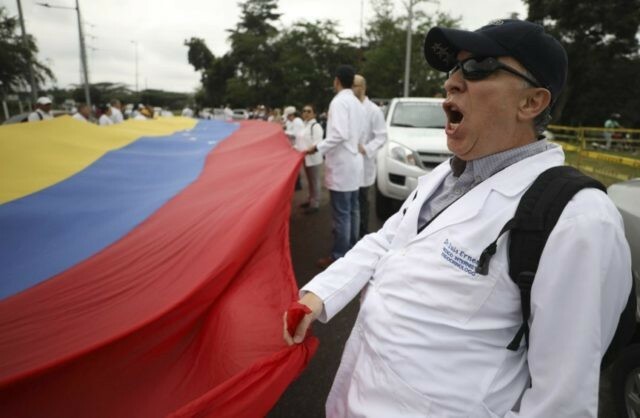 Venezuelan doctors! What do we want? Humanitarian aid! Why? Because our patients are dying!” the protesters chanted. They also waved the Venezuelan flag and sang the country’s national anthem. Amid the crisis, interim President Juan Guaidó has vowed to help deliver the aid packages by appealing to the military and opening aid routes with the help of volunteers. “Once again, a direct order to the armed forces at this time: Allow the necessary humanitarian aid to enter to take care of your families, your sister, your mother, your wife, who surely need supplies and some of whom, unfortunately, surely also have certain health conditions,” he told reporters on Sunday.